This offer is just too good! it is surely time for all those that has multiple Airtel sims to reap the fruit of their labour. Airtel is giving away 20times worth of Voice and Data bonus to customers who haven't used their sim for the past 30days. That is to say that this offer works best on sims that has not been recharged or used to make call or send an SMS for the past 30days. 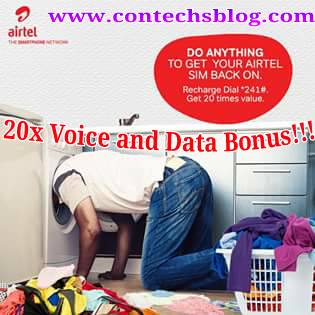 If you have an Airtel sim that you've not used for a month now, just bear it in mind that the worth of that sim has just gone beyond your expectation as you can get 500Naira Voice bonus with 1500Naira worth of data by just recharging your sim with 100Naira airtime and then dial airtel's 20x bonus shortcode! Exciting isn't it? It sure is! Rush now and pick up that Airtel sim you've dumped for some time now and recharge with just 100Naira or more to get 20x bonus on the value of recharge you made, it's as easy as that. √ Choose the Amount you wish to recharge and also know that any amount you recharge is the amount of bonus you receive in twenty folds i.e If you recharge 500Naira, you would receive 20x bonus of 500Naira as Voice and Data. √ Now recharge your line with the amount you've decided and dial *241# or you can directly dial the short code along with the amount you recharged I.e if you recharged #500 then you should dial *241*500# and *241*100# for #100 and so it goes. √ You would then be given 20x bonus of your recharge in forms of Voice ( For Calls ) and Data ( For Browsing ). √ All Bonuses are Valid for 30Days and you can check your balance by dialing *123#. Rush Now and Don't Be Left Out! Confy Scenty is a Unique Tech Blogger who's aim is to make an impact in Technology. Tech is my passion, it is my calling and I'm always happy to answer to it. Get proxy video list to unblock essential videos which can be important for your work. This isn't at all related to the post, hope it's worth it. Thanks Confy.The 20x airtel package is real but I have an issue with checking the balance. *123# doesn't help at all. However *223# does. But data bonus that displayed for the *241*100# package is just 100Mb and not the promised 1500Mb. Hello Joshua, Thanks for your response. How much were you given for calls aside the 100MB you saw? I did the *241*100# package and got N500 call bonus and only 100Mb data bonus. I don't want to believe that Airtel is just promising 1500MB in vain. Hi Joshua, am very sorry about that, however i shall find out from some other person whom activated the package recently to know if the data bonus was reduced or if it has always been like that. Thanks once more for your response. However i believe we were the ones whom misunderstood Airtel, The bonus you received was what you were meant to receive,the fact is that they confused customers by promising to give N1500 worth of data, which in normal circumstances is about 2GB. Am very sorry about your experience, Thanks for stopping by and i hope to keep hearing from you. Great posting keep it up, click on http://www.nairaclass.com for more similar posts.